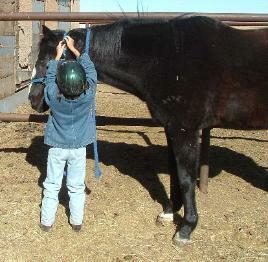 Horseback riding and lessons. 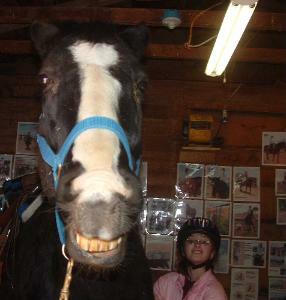 Meet school horse Bart. number tattooed in his upper lip. and color in their records and, for a fee I could have the information. I couldn’t resist. Bart was born in Kentucky in 1996. He was given the name of Millstreet. run but apparently didn’t like it. He won just over $20,000 in his career. 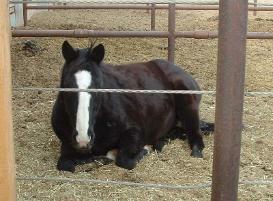 He is the tallest in the barn at 16 hands 1 inch tall and maintains weight at about 1050#. black more and more. 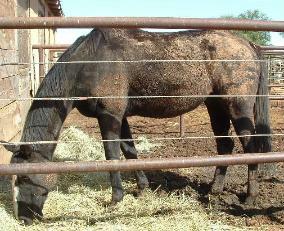 By the end of summer we usually have a brown saddle mark. headed so probably the same thing. 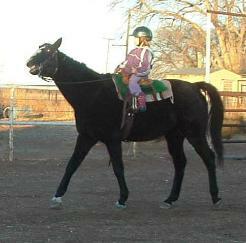 lunging wimp and wouldn’t want to trot with the rider. winter he could be caught, tacked and used without lunging. racehorse claustrophobia. He is not mean, just doesn’t like being crowded. Bart coming to his new home. own. 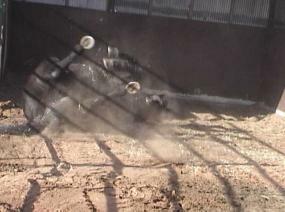 Nothing like a good roll to settle in. Look at the girl's face.